Fleet take-up of new diesel cars continued to drop last month, according to latest figures from the SMMT. 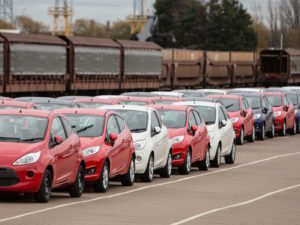 New car data for fleets in April shows that diesel accounted for 39.1% of registrations, with petrol taking 54.4% and alternatively fuelled vehicles (AFVs) covering 6.4%. This compares to 41.3%, 53.7% and 5.0% respectively in March. For the year to date, diesel registrations took up 42.1% of the fleet market while 52.4% went to petrol and 5.5% to AFVs – this compares to 42.8%, 51.9% and 5.2%. Across the whole of the UK new car market, diesel registrations declined 24.9% in April while demand for petrol cars grew, up 38.5% – giving diesel a 30.6% share and 63.8% for petrol. There was more positive news when it came to overall new car registrations with the SMMT data showing a jump in the market after last year’s VED turbulence. Overall UK new car registrations rose 10.4% in April, with private demand growing 26.3%, while the fleet market remained stable at 0.9%. However, business registrations saw a significant decline, falling 12.9% compared with the same month last year. And for the year to date, the market was down 8.8%, with fleet registrations down 8.5%, business registrations declining 17.2% and retail registrations down 8.4%. New light commercial vehicle registrations rose in April, up 3.9% as 23,501 vans joined British roads. Demand grew across all segments except for pickups, which fell 13.5% to 3,332 units. Year-to-date market declined 2.3%, as monthly demand continued to fluctuate in 2018. Although some in the industry heralded the April rise as light at the end of the tunnel, Alex Buttle, director, car buying comparison website Motorway.co.uk, said: “After a year of falling new car registrations, this feels like a temporary respite for the car industry rather than a new dawn. His comments follow recent industry calls for the Government to take action to end diesel uncertainty, including from Ford’s UK boss, who said new diesels were “every bit as clean” as petrol cars. Last week also saw the announcement of new Bosch technology that it said could ensure the future of diesel. However, Suzuki’s UK MD has said that diesel is “finished” in the UK, as it drops the fuel type from its UK line-up – although the carmaker acknowledged that diesel had only been available in two of its model range, which is mainly smaller sized.